Crocodile Stitch Owl – With PATTERN! | That's Knotty! So, I sat down with my hook and some yarn, and came up with something knotty of my own! I wanted something eye catching with lots of texture, so I got on YouTube and started hunting around for patterns for the gorgeous Crocodile Stitch. After a few tries, I got the hang of it, and I have to say, I absolutely love it!! I ended up making three owls, one to represent each of my family members. 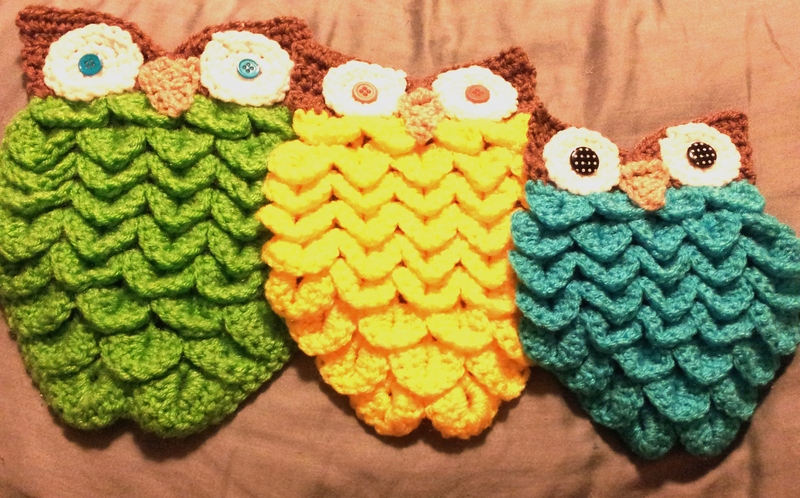 I used the same pattern for all three, but by using different hook sizes I ended up with three different sized owls. So I have two “parent” owls, and one “baby” owl for our little guy. I got on Facebook and posted a picture in a few crochet groups, and several people asked for a pattern. I couldn’t believe people liked my work so much to want to be able to replicate it! I had never written a pattern before, and it was definitely a daunting task, After hours of hooking and writing the pattern out as I went, I finally had it written down. So, I went back to Facebook, got a few testers, and released my pattern out into the crochet world. After taking in the advice of my testers, and adjusting the pattern where needed, I am finally ready to share it with all of YOU! Row 2 (first CROC row) – SK 1st DC. Working around post of 1st DC of first 2DC set, work 5 DC from top to bottom. Rotate piece and work 5 DC around post of 2nd DC (One CROC stitch made). SL ST in top of single DC. Crocodile around next 2DC set. CH 1. Row 3 (structural row) – Working with WS facing you, work 2 DC around post of last DC from previous row. CH 1. 1 DC in center of CROC stitch. CH 1. 2 DC in SL ST. CH 1. 1 DC in center of CROC stitch. CH 1. 2 DC around top DC of CROC stitch. CH 1. Row 4 (CROC row) – CROC stitch in first 2DC set. SL ST to single DC. Continue working CROC stitch around each 2DC and SL ST in each single DC across. CH 1. Row 5 (structural row) – Working with WS facing you, work 2 DC around post of last DC made in previous row. CH 1. 1 DC in center of CROC stitch. CH 1. 2 DC in SL ST. CH 1. 1 DC in center of next CROC stitch. CH 1. 2 DC in SL ST. CH 1. 1 DC in center of next CROC stitch. CH 1. 2 DC around top DC of last CROC stitch. CH 1. Row 6 (CROC row) – REP row 4. Row 7 (structural row) – With WS facing you, 2 DC around post of last DC made in previous row. CH 1. 1 DC in center of CROC stitch. CH 1. 2 DC in SL ST. CH 1. 1 DC in center of CROC stitch. CH 1. 2 DC in SL ST. CH 1. 1 DC in center of CROC stitch. CH 1. 2 DC in SL ST. CH 1. 1 DC in center of CROC stitch. CH 1. 2 DC around top DC of last CROC stitch. CH 1. Row 8 (CROC row)- REP row 4. Row 9 (structural row) – With WS facing you, SL ST twice around post of last DC from previous row. SL ST in center of CROC stitch. CH 3 (counts as DC) and 1 DC in center of CROC stitch. CH 1. 1 DC in SL ST. CH 1. 2 DC in center of CROC stitch. CH 1. 1 DC in SL ST. CH 1. 2 DC in center of CROC stitch. CH 1. 1 DC in SL ST. CH 1. 2 DC in center of CROC stitch. CH 1. 1 DC in SL ST. CH 1. 2 DC in center of CROC stitch. CH 1. Row 10 (CROC row) – REP row 4. Rows 11-16 REP rows 9&10, with odd numbered rows being structural rows, and even numbered rows being CROC rows. Row 17 (structural row) – With WS facing you, SL ST across first CROC stitch, ending at first SL ST of previous row. SL ST into SL ST. CH 3 (counts as DC) and 1 DC into SL ST. CH 1. 1 DC in center od CROC stitch. CH 1. 2 DC in SL ST. CH 1. 1 DC in center of CROC stitch. CH 1. 2 DC in SL ST. CH 1. 1 DC in center of CROC stitch. CH 1. 2 DC in SL ST. CH 1. Row 18 (CROC row) – REP row 4. Row 19 – SC along top edge of work, ending with 20 SC total. Tie off. Attach head color to first SC of Row 19. Row 5 – 2 HDC in first HDC. 1 HDC in next 18 HDC. 2 HDC in last HDC. Tie Off, leaving a VERY long tail. Using yarn needle, weave tail through tops of first 11 HDC. Going behind work, insert needle into 11th HDC of Row 1 of head. Pull tight. Wrap tail around center several times, pulling top row down to bottom row, creating triangular sides. Tie off on back of work. Round 3 – CH 2. *2 HDC in first HDC, 1 HDC in next HDC. Repeat from * around. Join with SL ST to top of first HDC. Tie off leaving long tail. Use tail to sew eyes to head. Hot glue buttons to center of eyes. CH 6. SC in second CH from hook. HDC in next CH. DC in next CH. TR in next CH. DTR in last CH. Tie off, using tail to sew beak to head. Thank you for trying out my Crocodile Stitch Owl pattern! For questions or comments, please email thatsknottyblog@gmail.com and put Crocodile Stitch Owl in the subject line. Please keep in mind, this is my first written pattern, so I’m open to suggestions for how to make it better! I started out using your pattern to make an owl, but after I did the second row, I just stopped looking. I did email you a photo of my owl once it was complete. I can say that it does not look much like yours and I will need to start again and follow your pattern in order to get the top of the owl to look correct. My owl has nothing but eyes and a nose at the top it seems, unless you turn it over, then he has more, but we do not want to look at it from the back. It’s a process I guess, you live and learn crochet, then you just crochet…and live. Hello! Thank tou for this useful and lovely pattern! Thank-you for the time and effort that you put into this pattern. It is very well written and precisely what I was looking for. I had searched the internet for a cute, free pattern and was about to give up when I found this!